The Commercial Studio Cycles are NordicTrack's answer to Peloton, bringing high energy, calorie burning gym workouts right into your home gym so you can train on your own schedule. Whenever you feel like taking a class, all you need to do is hop on and go! There are currently two cycles in the series: the base Commercial S15i and the more advanced Commercial S22i. They are nearly identical, except the S22i has a larger Smart HD touch screen display. Otherwise, there really isn't much difference between the two. Check out these great new studio bikes on sale now at NordicTrack! The NordicTrack Commercial Studio Cycles have definitely been the most anticipated series from the company in quite some time. The company took their popular Grand Tour Series and added more features and capabilities, plus more durable, commercial grade construction. This allowed them to compete directly with Peloton, a company that has owned the in-home studio cycle market for several years. You have the S15i and the S22i, and both of these bikes give you just about everything you could ask for in an indoor cycling bike. 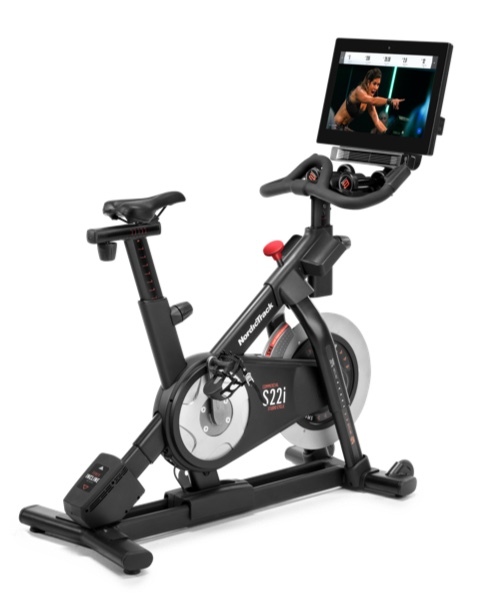 The base model in the series is sleek, space-friendly and light weight, with a 14" Smart HD touch screen, an inertia enhanced flywheel, 22 resistance levels, 10 degrees of decline, 20 degrees of incline, a Watts Power readout and gym quality construction. The long list of features includes a music port, speaker system, leveling feet, one touch controls, padded adjustable seat, workout fan, multi position handlebars, transport wheels and two water bottle holders. As we mentioned above, the only difference between the S15i and the S22i is that the latter has a larger 22" Smart HD touch screen. Otherwise both bikes are the same, except for the price of course. The S22i is about $400 more because of the larger display. The main draw of both NordicTrack Commercial Studio Cycles is of course the workouts. Both bikes come with a free year of the company's iFit program, which is unlike anything else you will find on the market today. iFit gives you access to LiveCast workouts, which are actual personal trainer led cycling classes, with you being one of the participants. The trainer can automatically change the incline and decline levels on your bike, creating a real-life in studio experience that is truly motivating. Another exclusive feature is Google map integration, which allows you to choose any location in the world and have a coach train you there. So whether you want to work out on a mountain, in a desert or on the streets of Rome, you have that capability. You can choose from an endless library of workouts on the bike, and the Studio Cycles come with two 3 pound dumbbells which you can use for workouts off the bike. Coaches will guide you through all of these programs so you know exactly what to do. 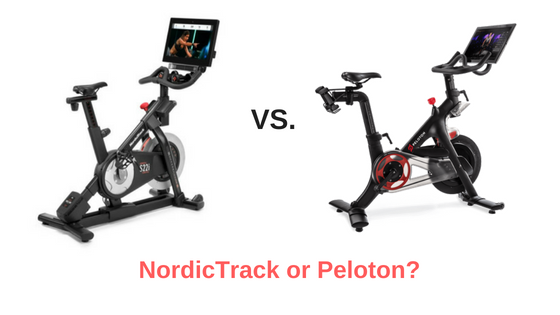 How do the NordicTrack Commercial Studio Cycles Compare to Peloton? We've been asked about how the NordicTrack Commercial Studio Cycles compare to the Peloton bikes, specifically the S22i vs Peloton. We would definitely say that NordicTrack's Grand Tour series doesn't hold a candle to Peloton, but the Commercial series offers a more apples to apples comparison. Let's take a closer look at what Peloton offers, and then we'll do a head to head comparison to see which one comes out on top. Peloton offers just one bike currently and it costs $1,995. You need to pay for at least one year of membership, which costs $39 per month. So you're talking about just under $2,500. The bike is 59" long, 23" wide and 53" high, so it has slightly larger footprint than the NordicTrack S15i and S22i. It has a 22" HD display, larger than the one on the S10, but as large as the one on the S22i. Construction is solid, with a powder coated welded steel frame, Poly V belt drive, aluminum pedals and forged steel crank arms. It's interesting to note that although we're confident that the overall construction is probably a bit better on the Peloton, the warranty is actually much better on the Nordictrack. The Peloton bike comes with one year on the touch screen, 5 years on the frame, one year on the components and pedals and one year of labor. That's not very comprehensive, especially given the high cost. The company also suggests a max weight limit of 300 lbs, as opposed to 350 lbs. on both NordicTrack Commercial Studio bikes. As far as the workouts, the Peloton offers a growing library of in studio workouts, as well as off the bike training and scenic locations...similar to what NordicTrack offers. However, Peloton actually offers dozens of live classes that you can attend in addition to prerecorded...Nordictrack's iFit currently includes only prerecorded classes. The iFit program does offer additional features like nutrition programs, sleep recommendations and other tools that Peloton does not offer. In addition to the live class capability, Peloton is definitely a more social phenomenon than any of NordicTrack's cardio equipment is. There is a huge Facebook community, live meet up events, real studios you can go to...so there's a "cult" element to it that many users find both motivating and rewarding. As you can see from our review and the table above there are definitely some pros and cons to each of them. Pricewise, at least initially, the NordicTrack Studio Bikes come out ahead. The Peloton will cost you about $2,500 all in for the first year, while the S15i will cost you around $1,599 and the S22i $1,999 with iFit included. After the first year, both will require a monthly subscription around the same price of $39/mo. Construction wise, the Peloton has the NordicTrack beat. Keep in mind that Peloton only makes the bike (and now a new treadmill) while NordicTrack makes a number of treadmills, ellipticals, bikes, rowing machines and other cardio equipment. So they definitely can focus much more attention on the build quality. But again, the warranty isn't as strong as it should be given the price of the bike. As far as the display, the Peloton and the S22i are equally sized, but the Peloton is strictly for the studio/destination workouts while the NordicTrack's gives you a bit more interactivity with iFit. However the Peloton comes with a forward facing camera and audio capability for interacting with other members. As far as the workouts, we'd probably give the edge to Peloton due to the live classes that you can participate in. Although the recorded classes on the NordicTrack are great, it's hard to beat the feeling of an actual live class, where you can compete real time with other riders and really feel the energy. However, iFit Coach does have a more extensive library of workouts, and you can choose your own locations with Google maps. Both companies are always enhancing the workout element with more options for you. Note that the Nordictrack Commercial Studio Pro bikes come with incline and decline, not available on the Peloton, so if you strip away the memberships from both, the S15i and S22i are more versatile bikes. So if you ever decide that you no longer want to pay the membership, you'll be better off with the NordicTrack than the Peloton as far as what you can do on the bike itself. The new NordicTrack Commercial Studio Cycles are a great addition to the company's lineup, and will likely gain a huge following due to the large amount of features and capabilities that they offer. They are more expensive than the company's Grand Tour series, but the S15i and S22i are a big step up in quality, putting them in direct competition with Peloton. If you're looking for an in-home workout that it just like you get at your health club, then a Studio Cycle is a definite winner. As far as the S15i or S22i vs Peloton, it's really a personal choice and arguments can be made for both of them. The NordicTrack definitely gives you more capability and versatility, and the iFit program is much more advanced. However, it's hard to beat the live classes of Peloton, and if you want to be part of a huge community of people you might prefer the Peloton experience. Compare specs and get great sale pricing on this bikes here!